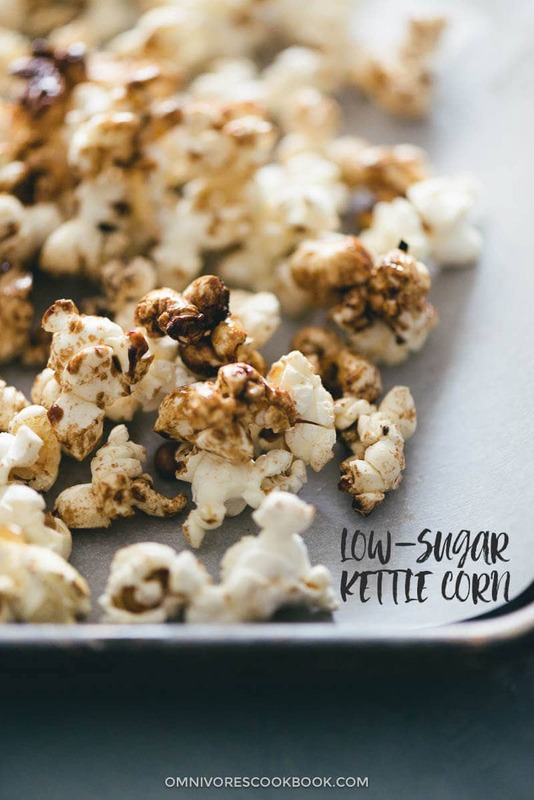 A kettle corn recipe that uses way less sugar with one secret ingredient. 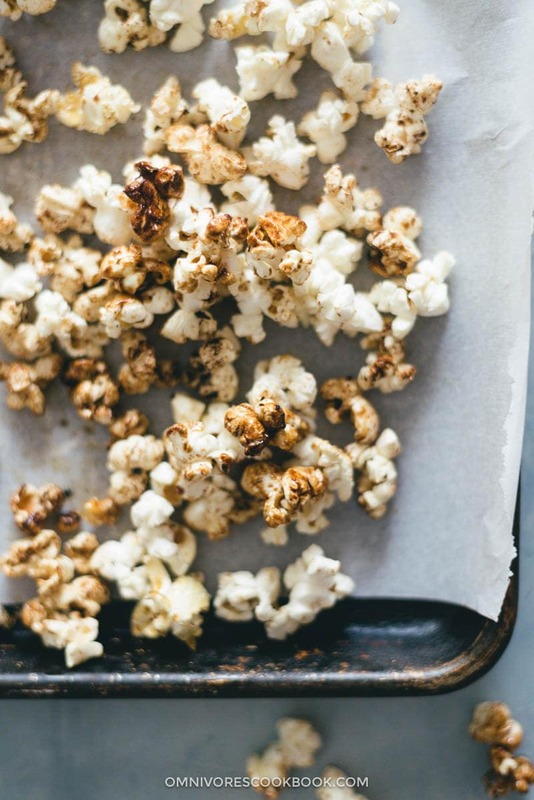 It creates beautifully caramelized popcorn with a mild, sweet taste and a hint of savory. Super simple to make and highly addictive! I still remember the surprised look on my friend’s face. Yep, the popcorn that I’ve been eating growing up was the sweet kind, a.k.a. kettle corn. Just as its name described, it’s cooked in a kettle. 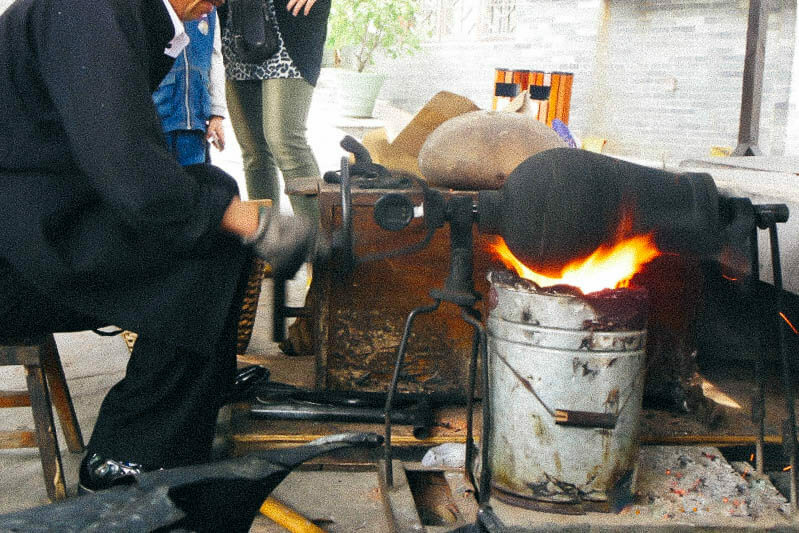 The old fashioned popcorn machine used by Chinese street vendors is made with cast iron. It is shaped like a pear lying on its side with a handle attached on one end, which is shaped like a steering wheel. The kettle is supported by two poles to elevate it from the ground. Underneath the kettle is a bucket of charcoals, close enough so the flame will heat up the side of the kettle evenly. To make the popcorn, the street vendor will drop a handful of popcorn into the kettle, drizzle a little oil in and sprinkle some sugar on top. Then they light up the charcoal and start to rotate the kettle constantly. After a few minutes, you will hear a big BANG even standing 50 meters away. Putting this machine on the street of the US, the nearby pedestrians would duck down to the ground and try to find cover when the machine pops, because it does sound like a bomb going off. Although it was the favorite sound of every Chinese kid back then—the big bang always meant freshly popped kettle corns! You are unlikely to see those scenes on the streets of Beijing anymore, since most vendors have switched to safer and more modern western-style machines to make popcorn. Nonetheless, the old-fashioned kettle is still a fond memory from my childhood. 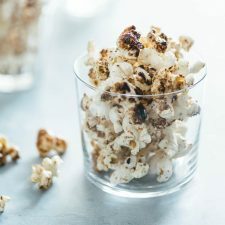 Recently I discovered a wonderful way to make less sugary, super delicious stovetop kettle corn that brings back my favorite childhood memory—caramelized and sweet, but not overly sweet. Here I want to say a BIG thank you to my friend Polly A., who has been sharing different flavors of popcorn with me. 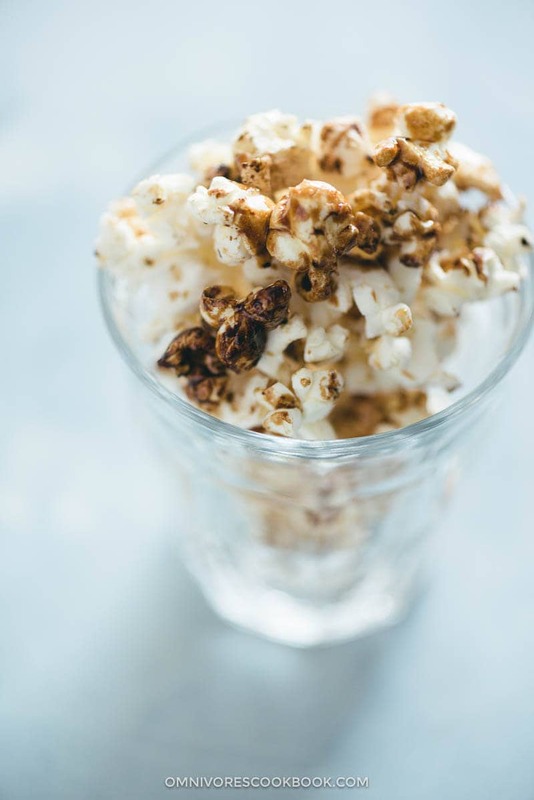 After a lot of brainstorming and testing in the kitchen, I created this recipe—a sweet popcorn recipe that uses minimal ingredients, is healthier than your usual kettle corn, and is addictively good. 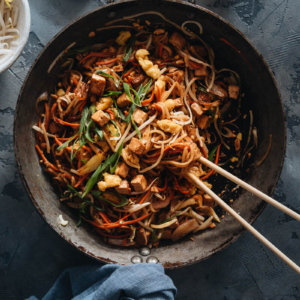 The magic happens when you combine just a small amount of sugar with a few drops of soy sauce. 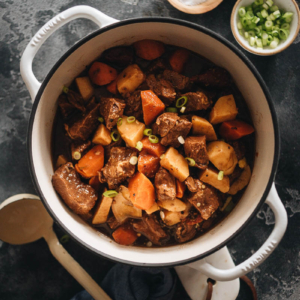 The soy sauce helps with caramelizing the sugar and enhancing the sweetness. At the end of cooking, you will get a handful of beautifully popped sweet corn with a dotted brown coating and just the right amount of sweetness with a hint of savory. I also added a tiny pinch of chili flakes, just to spice it up a tad. Believe me or not, it gives you the same sensation as when eating caramel and sea salt popcorn. 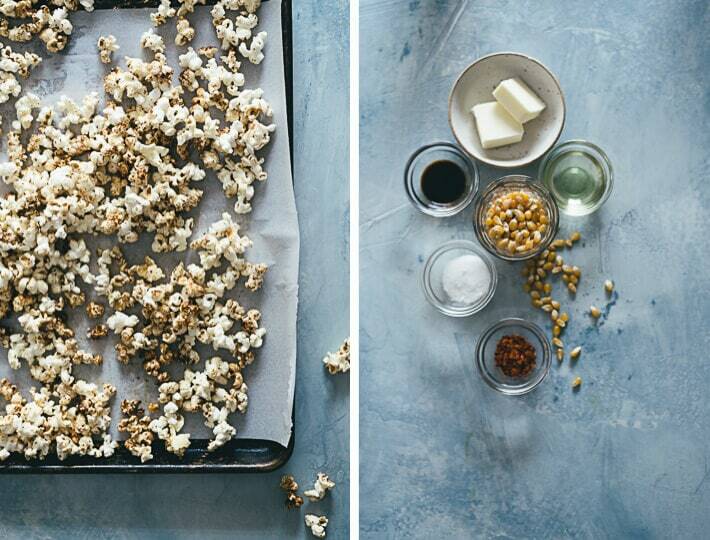 This recipe produces sweet popcorn that is not overly sweet. If you like a sweeter version, double the sugar and soy sauce. Note, because the sugar tends to burn when you cook the popcorn on the stove top, make sure to leave the pot lid slightly ajar and shake the pot while you’re cooking. Prepare all the ingredients near your stove and place the pot lid on the side. Prepare a baking sheet lined with parchment paper. Add the butter and vegetable oil to a 3-quart (2.8-liter) heavy duty deep pot. Heat over medium heat until the butter has melted. Add 3 to 4 popcorn kernels. Now you can enjoy the popcorn while it is still warm! The popcorn will stay crispy for 2 to 3 hours if your room is dry. 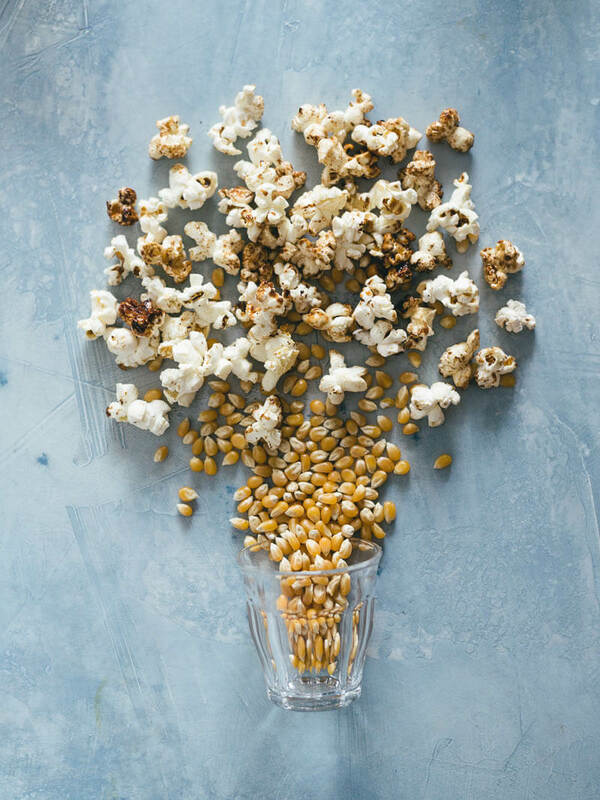 For longer storage, wait until the popcorn cools down to transfer into a Ziplock bag and store at room temperature. Although it’s highly unlikely you’ll need to because the popcorn will be all gone really soon! I used Chinese chili flakes in this recipe. 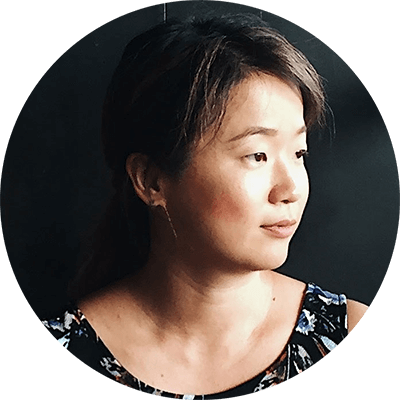 Alternatively, you can use Korean chili flakes or 1/8 cayenne powder. 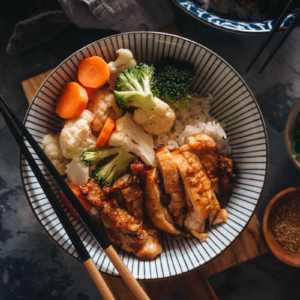 There will be splatters once you add the soy sauce, so keep the pot lid nearby and cover the pot as soon as you add the soy sauce. This step allows the popcorn to heat up without over-cooking the sugar. Make sure the gap is facing away from you because there will be splatters. It usually takes me 3 to 4 minutes to finish the cooking once the kernels start to pop. But time may vary. I loved hearing about your childhood popcorn memories – that kettle thing is so cool! This popcorn looks so yummy. I LOVE popcorn, and I’m all about different varieties, so I’m excited to try this one!